MACOMB, IL – Professor Aaron M. Kuntz, head of educational studies in psychology, research, methodology and counseling at the University of Alabama, will lead a research symposium at Western Illinois University from 5-7 p.m. Thursday, Oct. 26 in the University Union Heritage Room. 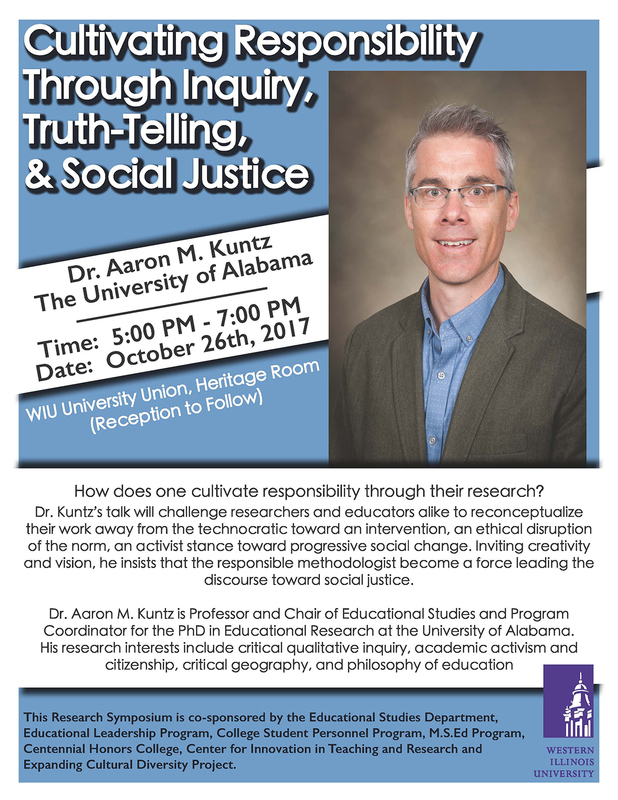 During his discussion, titled "Cultivating Responsibility Through Inquiry, Truth-Telling and Social Justice," Kuntz will ask the audience to rethink how they have recently idealized progressive social change. A reception will follow his presentation. Kuntz's research interests include critical qualitative inquiry, academic activism and citizenship, critical geography and the philosophy of education. This event is co-sponsored by WIU's Educational Studies Department, the Educational Leadership program, the College Student Personnel program, the M.S.Ed Program, the Centennial Honors College, the Center for Innovation in Teaching and Research (CITR) and the Expanding Cultural Diversity Project.